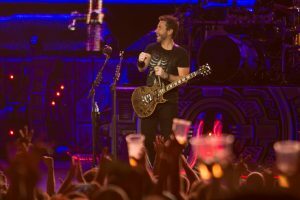 On Tuesday night Nickelback brought their Feed the Machine tour to Klipsch Music Center in Noblesville with supporting acts Shaman’s Harvest and Daughtry. 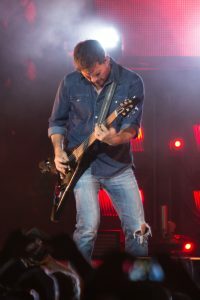 The 44 date tour supporting Nickelback’s ninth studio album was scheduled to kick off in Noblesville on June 23, however substantial flooding forced the show to be delayed until the end of the first leg of the tour. As lead singer Chad Kroeger would later note thanks to the horrible June weather, the band got to perform for 20,000 fans, about 2,000 more people than had tickets to the originally scheduled show. 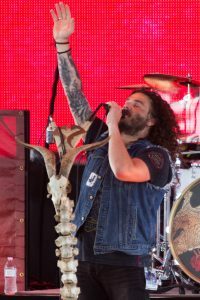 Shaman’s Harvest opened the show promoting their sixth album, “Red Hands,Black Deeds”, with a set of enjoyable, but not memorable, southern rockand post grunge inspired songs. Next up Daughtry took the stage. 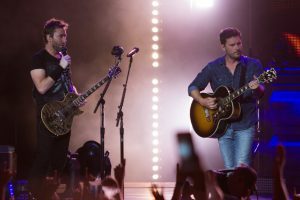 The band treated fans to a set that felt a lot like a greatest hits album. 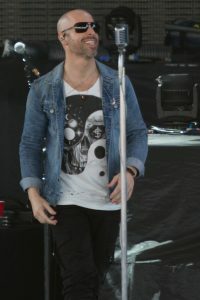 Sadly though front man Chris Daughtry’s vocals seemed tired despite his energetic movements and expressions. The shining light in the set was the performance of Backbone, a song from that is set to appear on the band’s upcoming fifth studio album. Feed the Machine imagery, you could feel the energy and anticipation of the crowd. 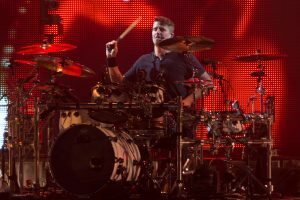 The venue erupted as the band members appeared on stage one by one before launching into the rhythmic riffs of the tour’s namesake song, Feed the Machine. The electric energy continued to pulse through the crowd as the band moved onto fan favorites Woke Up This Morning and Photograph. Chad then took some time to talk to the crowd noting that this was the last show before the band took a week long break so if it was ok with the fans there was going to be a lot of drinking. This ended up being a promise he and guitarist Ryan Peake kept, doing Jaeger bombs throughout the rest of the set. The band slowed the tempo down playing several of their well-known ballads and softer songs before amp-ing the crowd back up with Something In Your Mouth off their 2008 album Dark Horse. The band brought 2 fans on stage to sing Rockstar, which for fans of the song was a huge disappointment. If you wanted to hear an intoxicated friend butcher your favorite song it would have been cheaper to spend the evening at home playing the video game Rock Band. After Rockstar, Nickelback covered The Eagle’s iconic Hotel California before closing out their set with some of their best hard rocking hits. The encore brought the band out for 5 more songs. Thanks to the addition of the afore mentioned Jaeger Bombs, the pace of the show was slower than expected. Even with the band omitting the performance of Save Me with Chris Daughtry this caused the band to only get through half of their typical encore before the local noise ordinance required the show to stop. The band pandered to the crowd and seemingly negotiated with the sheriff’s department for more playing time allowing them to close out the show with This Afternoon and Burn It to the Ground. Overall, Nickelback brought a solid musical performance that sounded just like you were listening to their studio albums with some stories from the band thrown in between. Nickelback has always been a very divisive band. Since hitting the mainstream music scene in 2001 people have either loved them or hated them, and it’s safe to say the crowd at KlipschMusic Center absolutely loved them.